Sabrina – Secrets of a Teenage Witch DVD Giveaway! Fine Print: I was given a copy of the movie for review and one is being given to a reader. All opinions and statements below are my own. If you are an old fogie like me, you hear the words Sabrina The Teenage Witch and think of Melissa Joan Hart chatting with her cat Salem. Well now Sabrina is an animated character voiced by Ashley Tisdale! Ashley Tisdale (High School Musical, TV’s “Phineas and Ferb”) makes magic in her Daytime Emmy®-nominated role as television’s favorite teenage witch in the hugely entertaining movie adventure Sabrina – Secrets of a Teenage Witch: A Witch and the Werewolf – The Movie, arriving on DVD (plus Digital) and Digital HD September 9th from Lionsgate Home Entertainment. Based on the hit Archie comic book series, Sabrina – Secrets of a Teenage Witch: A Witch and the Werewolf – The Moviefollows the charming Sabrina Spellman (Tisdale) who leads a double life as both a klutzy high schooler and superhero sorceress. The movie is a co-production of Splash Entertainment, Archie Comics Productions, DSK Entertainment LLC, Laughing Lion and Telegael. Sabrina (Tisdale), everyone’s favorite half-human, half-witch, is back in a magical movie adventure filled with spells, excitement and tons of fun. When a magic jacket turns Sabrina’s friend Harvey into an uncontrollable werewolf, Sabrina’s off on a wild chase between the human and witch worlds to stop his rampage. Join Sabrina on her bewitching escapade to find a cure and save the day! My son and I got to watch this movie and he really enjoyed it. Here is his take: “The best part about the movie was that the girl who plays Sabrina is the same girl who plays Candace on Phineas and Ferb. That’s just awesome. I do think that girls will like this movie more than boys, but it was really funny and there weren’t any scary parts for an 8 year old. Little kids might be a little freaked out by the werewolves, but they’re not really scary for older kids.” So there you have it! I have to say that I enjoyed hearing Candace’s voice as well, but Sabrina is a fun tale in it’s own right. It’s not the same show that we knew as kids, but it’s a harmless animated film that your kids will enjoy. 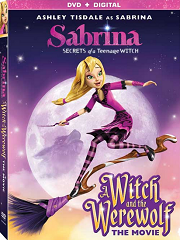 To get everyone exited about this animated witchiness, I am giving one lucky winner a copy of the Sabrina – Secrets of a Teenage Witch: A Witch and the Werewolf DVD! To enter this giveaway, complete any or all of the options listed below. Giveaway ends 9/14. Good luck! Twin spell…So there could be two of me . One to play and one to get stuff done. I would want a spell to do all the cleaning for me! I think the spell i would do is to do all my household grocery shopping. I would do a spell to have a beautiful garden. I can’t grow a thing where I live. Mine would be for my family to be safe. We have a lot of birds so I would cast a spell to clean all of the bird cages. I like the clean the house spell 🙂 I would love to cast a spell to have my family appear at my house when I like 🙂 They all live far and I don’t see them often. I would love the double! Two of me as someone said above. One to do the fun things and the other to get the work done and at times two to get the work done! Everyone to be happy would be another one.